The Southwest of France is a region rich in wine diversity, and many readers of wine-pages will have discovered the strapping reds of Cahors or Madiran, the delicate whites of Jurançon or the fabulous sweet wines of Pacherenc du Vic-Bilh. But in fact there are a dozen or more smaller appellations in the Southwest that lie beyond these big(ish) names, and which, for many people, are joys waiting to be discovered. 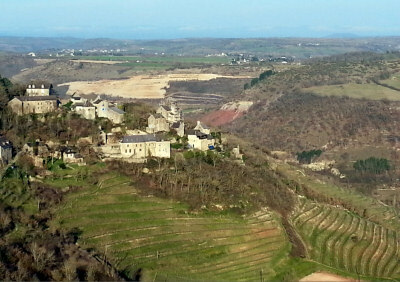 In the northeast of the region, Marcillac is a small, hilly area that feels remote when you make the two-hour drive from Toulouse – though in summer direct flights from the UK land at the tiny local airport at Rodez. This is red wine country where the Mansois grape variety is king, with 90% of plantings. Mansois is also known as Fer Servadou, and crops up occasionally in other regions of the Southwest. This is a relatively cool area, the vineyards on steep, usually terraced sites covering the southern slopes of craggy hills and mountains that form a natural amphitheatre. Plantings are at between 350 and 500 metres, and the most interesting soils are a deep, rich red known locally as les rougiers, which is iron-rich clay on a limestone base. The climate is determined by many factors including some Mediterranean and Atlantic influence, the mountains, and the winds that funnel constantly through the area. Winemaking declined steeply through the 19th and early 20th centuries. A series of natural disasters – powdery mildew, Phyloxerra, a devastating frost in 1956 – dramatically reduced the vineyard area. But in the latter half of the 20th century the vineyards were gradually rebuilt, with the award of the VDQS classification in 1965 and, finally, full appellation contrôlée status in 1990. Today, the excellent local co-operative accounts for 55% of total production with a dozen estates providing the rest. I visited Marcillac in spring 2014 along with my colleagues in The Wine Gang. It was a brief one-day visit where the cooperative cellars hosted several of the local estates, each of whom showed two or three wines. We had time for a brief and exhilarating tour of the region, visiting the vineyards of Domaine du Cros. As an overall summary, I really enjoyed these wines. There was a lovely fruit quality and edge of freshness running through them, a bit of steel as well as ripe sweetness thanks to the Mansois grapes and the cooler growing conditions. It takes a little work to find the wines of Marcillac on UK shelves, but the effort will be rewarded. See all stockists of Marcillac wines on wine-searcher. This 33-hectare property is planted entirely to Mansois and is the biggest private estate in the region with a 150,00 bottle production. 30% is exported, the biggest markets being the USA, UK and Canada. In the UK the wines are with Caves de Pyrène and The Wine Society. With 130,000 bottle this is the biggest production wine. Deep and vibrant colour with inky and bright cherry notes. A certain iron oxide dryness on the palate, dry and a touch herbal. Fresh, sappy, good flavours, that dryness is there but a cherry-skin grip and juiciness, a big hit of tannin too adding a chewy firmness. Only 12.5% alcohol. 87/100. Vines here are between 50 and 90 years old, and the wine is aged in old, large barrels, coopered from local oak many years ago, though it is fermented in steel. Still a very pure and bright colour. A nutty touch to this, but a nice perfume with tiny floral notes, some pepper and spices. The palate is deliciously sweet and creamy, with more mid-palate density and weight to offset the tannins. Lovely, the sweetness and cream is delightful against the Mansois structure. 90/100. Similar very youthful colour. Has developed a nice touch of game and much more pepper and spice, a lovely complex quality to this. The red fruits are there, dry cranberry and raspberry. The oak on this seems to be more prominent, adding a little custard and vanilla cream. Lovely dry palate and fruit sweetness. 90/100. 3000 bottles of this wine from the red, iron-rich soils. It is aged 10 months in barriques, with 20% new each year. Smoky, tobacco and wispy woodsmoke added to the creaminess of the berry fruit. The tannins are firm and grippy. Does that leave the mid-palate a touch lacking in flesh? Perhaps just needing some time for the tannins to mellow as it has good earthy and meaty quality, spices in the finish too. 89/100. Michel Rolland has consulted here. All Mansois this comes from a very ripe year for the region. Bold crimson, with that herbal edge again to the cherryish fruit, sappiness and a racy firmness. Has a big hit of tannin and a liquorice twist of freshness. 87-88/100. Mansois with a tiny percentage of Merlot in the blend, this is the top wine of the estate. The vanilla and custard oak is rather prominent, but the palate has lots of creamy and fleshy, ripe flavours. There is a plum and cherry red fruit concentration, the tannins have been smoothed and there is enough substance in the mid-palate. 89/100. This is not Marcillac but IGP d’Averyon, a white blend of Chardonnay, Muscadelle and Chenin Blanc with some barrel fermentation. Wool and gentle lanolin notes, buttery, with a touch of orange. It’s all pretty low-key, but attractive. The palate has a little sweet and sour character, the 12% alcohol makes it crisp, but there’s a certain grip to this. 87/100. All Mansois and 12.5% alcohol, this was a tank sample about to be bottled. Lovely lifted aromatics, lots of watercolour paintbox, lots of cherry freshness. The palate has lovely fruit sweetness, and quite high acidity, tart but beautifully fresh. 87/100. Mansois with 20% Cabernet Sauvignon, this spends one year in barrel aged from one to three year sold. It comes from a mix of limestone and rouge soils. Nice meaty, dark, rich nose, adding a lovely weight, but still with the bloody and dry herbal and cherry lift of the Mansois coming through. The palate is very firm, fairly unyielding, with those tannins really gripping across the dry concentration of the palate. Big, structured and dry, but impressively well balanced – a vin de garde. 90/100.All CS grown on south facing limestone. Another Mansois/Cabernet blend, an interesting wine which is aged in an old shepherds cottage at 1300 metres altitude, which Domaine Laurens thinks makes the tannins smoother by accelerating the ageing a little. Creamy and soft, the oak more subtle, with a grip and earthiness, and a rich palate that retains lots of juiciness, with delicious palate and structure too. Lovely and still seems very youthful. 90-91/100. Mansois and Cabernet Sauvignon. Lovely game and meaty development, the oak fairly prominent on this too, and either a touch of brett just an iron oxide character. Lovely and dry, arguably drying slightly. 88-89/100. 100% organic estate. wines fermented in stainless steel but then aged in cement tanks beneath the ground. This estate has also planted one hectare of the Prunelar variety which they believe willbe suited to their property. 100% Mansois with 12.5% alcohol. Ferrière is the name of the vineyard parcel, old vines planted by winemaker Claudine’s father on rougier soils. The ripe cream and raspberry red fruit freshness is smoothed by the ageing in cement, a very attractive quality here. A touch of liquorice, very nice smoothed tannins, and a sense of roundness and completeness. Lovely balance. 88-89/100. This estate is working organically and is currently in its first year of certification, and they work with essential oils to protect the plants. It was established and mostly planted in 1970 and the wines are with Caves de Pyrène in the UK. Jean-Luc Matha, Marcillac Cuvée Laïris 2012, France100% Mansois and only 12% alcohol. Cuvée Laïris (meaning hedgehog in Occitan) is a newer parcel of vines. It is a little reduced, with a small funky note, herby and earthy. There’s a freshness to this through the high acidity and the firm tannin, but somehow it has a softness too that is really pleasing. Deliciously easy to drink. 87/100. Jean-Luc Matha, Marcillac Cuvée Peirafi 2008, FrancePeirafi means “small stones.” 100% Mansois and 12.5% alcohol. From limestone soils, this is foot-trodden in large open vats before 20 months in old oak barrels where it ferments with natural yeast. Beautifully ripe rich and bloody nose, lots of black and red fruits, a little smoky. The palate has delicious ripeness and roundness, really nice texture here and the rich, full, iron-oxide-touched character. Long and delicious with spice and a touch of vanilla, but not at the expense of the varietal character. 90-91/100. Jean-Luc Matha, Marcillac Cuvée Peirafi 2007, FranceSame winemaking recipe as the 2008. Powerful gout de terroir, quite funky and visceral. The palate is a touch sharper and more cherryish, with peppery and fresh character, with crunch and freshness to spare, a lovely crunch and rhubarb touch of mulberry. Different from the 2008, but very good. 91/100. This is the Co-op, which makes 500,000 bottles annually. This 12.5% alcohol rosé is 100% Mansois, but the formula of how long to macerate changes each year. Very nice strawberry brightness to the fruit, a little cherry lift too, bright and attractive. Creamy strawberry sundae ripeness and a really nicely balanced palate. 86-87/100. 100% Mansois and 12.5% alcohol this is with Essentially Wine in the UK. A lighter colour here, a not quite so dark crimson. Has that herbal and cherry-touched character, nice dry fruit and that touch of iron-oxide dryness, but finishes quite softly with a certain chocolaty note, and no over-extraction. Lots of character, but easier to approach than some. 87/100. 100% Mansois and 12.5% alcohol this is with Market Coffee House in the UK. A small proportion of barrel ageing for this blend, and again has a nice lighter colour. Perhaps a slightly more open, fleshy, earthy character to this. The palate is dry and tight, that juicy cherry freshness is there, but it is grippy too and I like the softening, warming fudge and earthy edges to this. Very drinkable. 87-88/100. 100% Mansois and 12.5% alcohol this is with Essentially Wine in the UK. Grown in clay at the bottom of the slope. Co-op director Kasper Ibfelt says is the real expression of Mansois. “People either love it or hate it.” Again the colour is not too dense, and this is very tight, very green-flecked, bloody and dry, a touch of iron oxide, but it is about red fruits, hinting at cherry and some floral lift. The palate is cool, creamy and red fruited, with the asparagus-like herbaceous quality and the higher acidity giving this a real grippy edge, rather than outright tannin. Lovely, distinctive stuff. 89-90/100. 100% Mansois and 12.5% alcohol this is with Essentially Wine in the UK. Lovely smooth pepper and spice nose over grilled red fruits. It has a touch of Mansois sappiness, but the extra touch of rounding richness, but the mid-palate has a fuller, more complete character with spice and plenty of flesh. 90/100. 100% Mansois and 12.5%, this comes from the top of the slope on limestone. Lovely nose, stony and earthy and that herbal note of the Mansois comes through, but there’s an extra supple richness to this perhaps, a smoothing quality that is a little deeper and silkier. The palate has more structure arguably – trading a little of the charm – but such a lovely grippy wine with tight structure and spicy, mineral, peppery length. 90/100. 100% Mansois and 12.5%, this is aged in 500l and 225l barriques, one third new each year. It comes from the most concentrated juice. There is a pencil shaving and cedar touch to the oak. That adds some vanilla and cream to the aroma too, with red berry and cherry giving this quite a Burgundian feel. The palate has lovely spice and pepper, a real tight character to the acid and tannin, a bigger wine, robust, but still only 12.5%. Lovely structure and works very well. 89-90/100. 100% Mansois and 12.5%, made “because the vintage was so special,” it is the only release of this cuvée so far. It macerated longer and was again taken from the most concentrated juice. Only 3,000 bottles. Very nice expression of Mansois, with all the herby charm, such nice dry red fruit hinting at cranberry and cherry, and delicious, long tannins, giving this spice and creaminess and intense concentration. That natural intensity and grip is fantastic, with a touch of liquorice and plum skin grippiness. 92/100.